Despite the vast output of academic work on Ulster since 1969 there is much disagreement about the nature of, and solution to, the problem. Recent assessments of the literature (Whyte, 1991; O’Leary and McGarry, 1995) have identified a range of approaches that attempt to explain it: external explanations emanating from the unionist and nationalist traditions that focus on the responsibility of Dublin and London respectively; varieties of Marxian approaches along similar lines; and more academically sourced internal-conflict theories focusing primarily on relations between the unionist and nationalist communities within Northern Ireland. All of these forms of explanation account, to varying degrees, for the problem, but without being entirely satisfactory and, considered collectively, cast doubt ‘whether any single solution can be applied to Northern Ireland as a whole’ (Whyte, 1991, p. x). 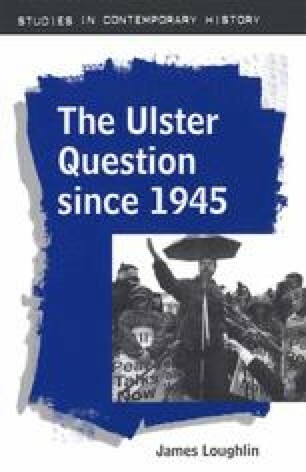 Most explanations of the Ulster question, however, rely heavily on interpretations of the region’s modern and contemporary history, and it is in an understanding of the question’s historical evolution that its complexity can be best appreciated.